Oooh, I can already hear the farmers and producers in Stellies muttering and grumbling already. I have waited nearly two weeks to write this post on Eben’s new wines. I have read everybody else’s posts on it – well Tim’s (he did two! ), Christian’s and Angela’s at least – and I think they sum up all the salient points well enough, but are perhaps hedging their bets. I left the tasting confused. No, not quite confused, more flummoxed. Partly because the wines take quite a bit of head work. They are the geekiest wines that I have tasted of Sadie, excluding, perhaps the Cape Charme. They seem to have stepped away from fruit a little and lean heavily on texture, structure, and balance to express their brilliance. All, though the Palladius is Queen amongst them, ask you, the drinker, to do the work. The rewards they offer already are sublime. Perhaps that was the reason for feeling flummoxed, I had encountered a slice of the sublime. I sat for a week and mulled over the wines in my head. Perhaps it is the lofty heights Eben has already attained, perhaps it is the expectation of his wines to do well that have fooled me into making this grand pronouncement. Perhaps. But, perhaps not. I think the Palladius 2011, with its labyrinth of varieties, is the best (young) South African wine I have ever tasted. It wasn’t so much what it tasted of, but what it was. Imagine a painting. A still life. The ones that resonate through the ages, well regarded by critics, and reprinted in art text books, are those that execute form, balance, and style best rather than the accuracy of reproduction. The Palladius does this. It balances intensity, weight, flavour, acidity, tightness, flavour and length perfectly. It is young, with many rewarding years in front of it, but now it already gives the willing drinker a reason to break out the superlatives. 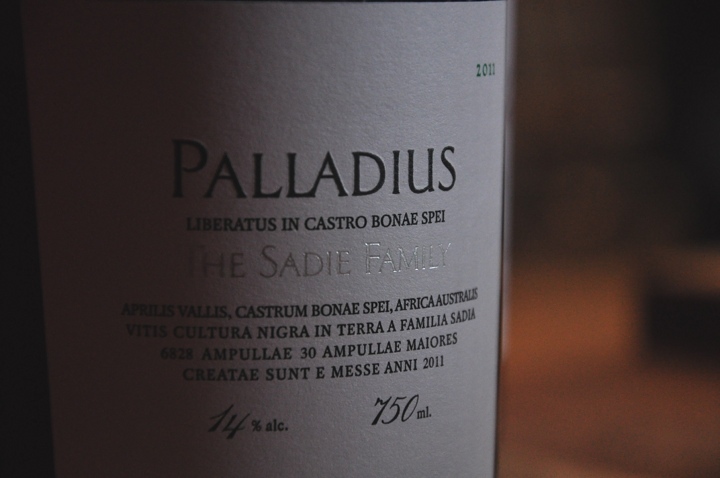 The Palladius was not released last year, and Eben allowed for 24 months maturation – a first for this wine – in various vessels. It’s a wine that all using the term ‘fine’ should taste. This is fine wine. Sculpted without any joins showing, tight and secretive about its future, resolved and complete. Last year it was the Kokerboom 2011 that blew me away for similar reasons. Profound was a word that was used. I prefer sublime, as it suggests the unknown, unseen and indescribable above emotion. 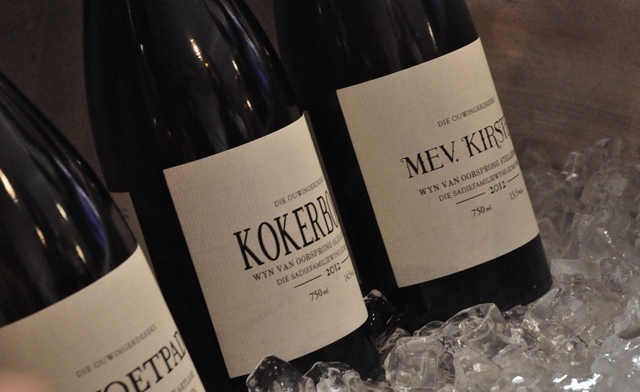 The Kokerboom 2012, a blend of Semillon and Semillon Gris, is less approachable than its older sister, but its bone dry, intense mineral core – that I found underpinning all the wines – showed how classy this wine is starting to consistently be. It’s already sold out and is going to be a South African cult wine in 5 years. Watch. It seems that Eben is understanding the vineyards he is working with better. 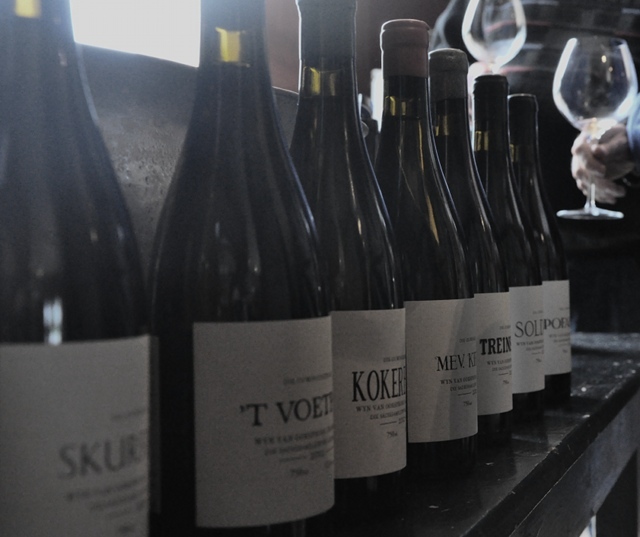 He must do, as the Ouwingerdreeks wines have improved every vintage since he started in 2009. Not uniformly, of course, I preferred last year’s Mev Kirsten 2011 – a Chenin from an ancient Stellenbosch vineyard – to this year’s 2012, as it seemed to better balance it’s lean core against the always present oxidative character. It still is a unique, very complex, and interesting wine. If there is one wine for collectors it’s this. Historic, beguiling and confusing as always. But improved as a whole they have. Each one becoming brighter, fresher, and more core heavy. Imagine a pear with a lead pit. A fleshy, juicy, fresh atmosphere around a dense, almost impenetrable centre. It is a characteristic that I have have recognized in all the ‘important’ wines I have tasted from Europe. It is, for me, and indicator of ageability and quality. And this whole range has it to some degree. Take the Pofadder 2012. I remember its first vintage the 2009, being a little rustic and simple. I am sure Eben could prove me wrong by opening a bottle of that wine today, but set against my memory at least, this vintage is already born beautiful. Fresh, and bright, straddling the line between jollity and seriousness happily. Spice, red fruit, and that telling core of intensity. Eben has told me that when you make wine from a 50, 60, to a hundred years old vineyard “one has to grow up in the sense that you have to put yourself a little bit in the background and let the wine do its thing.” This has a little ring of paradox to it. That Eben’s skill as a winemaker has been figuring out how to do less in order for the wines to be more. But that understanding and pulling back is a bigger more difficult task, I’d imagine, than the most involved heavy handed winemaking. And while Eben says in his winemaking he looks to the past, rather than to the cutting edge, the Skerpioen 2012 a blend of palomino and chenin blanc must be at the cutting edge of fine wine worldwide. It’s vineyard sits just under 2kms from the Atlantic on the West Coast and Eben describes the soil as “completely decomposed sand, on chalk, with a pH of nine in the soil…and looks like it belongs in Champagne.” The alcohol is down 2% from last year. It’s purity now stands out even more, and is lean, rapier-like with a marked salinity. At R179 from Wine Cellar (if there is any left) it should cause everybody else selling white wine at this price to think again. Remarkable value. The T’Voetpad, one of my favourites from the first vintage, a field blend of Muscat d’Alexandrie, Semillon Blanc, Semillon Girs, Palomino and Chenin Blanc is this year zippy, delicate, floral and difficult. It was a wine that showed the journey from fruit to texture these wines have been on most clearly. Tim James wrote about the fascinating vineyard here. The Skurfberg 2012 is a blend of Chenin from three different sites, and had the fullest texture and most fruit of all the we wines. Broad, rich, intense with fine ninja acidity – cleaning up almost silently – letting you enjoy the flavours develop from pear to honey in your mouth. Perhaps, with the Pofadder, the most readily enjoyable. This year the red wines seemed on a level playing field with the whites when it came to interestingness. The Soldaat 2012, a Piekenierskloof Grenache, manages that intense core with grippy tannins, zippy acidity and sweet fruit, incredibly. Spice, fresh earth, a hot road before rain, dense red fruit, but all seemingly weightless. I had the most fun with this one. The wine struggled with last year, again frustrated me. The Treinspoor from 100% Tinta Barocca has big tannins, balance, freshness, intensity, all the good things, but I couldn’t quite get my head around it. Angela loved it, Tim not so much, and Christian I think is somewhere in between; he’s “88 on that”. I’m OK skipping it. But come on, Christian, it’s at least 90-something. If Eben is an author, these wines make up his first lengthy, coherent, multi-layered, literary novel. What I think they do is show what’s possible with our oldest vineyards, and create a local benchmark more useful than an international one. Tasting that Palladius, and thinking back to it, make me proud of being a South African wine drinker. Prouder than any sports team could make me. Bravo Harry – so enjoyed reading…love the way you put words to paper!